She's not a fanatic. She's a true fan. 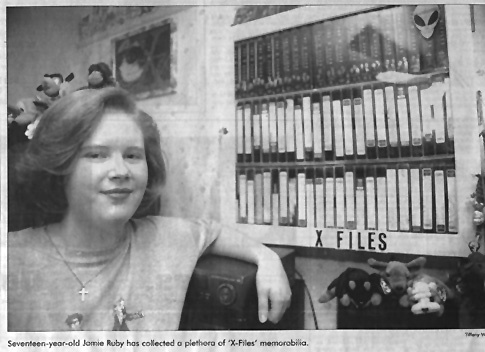 That's how 17-year-old Jamie Ruby was described this summer when she was on the set of the Fox TV show, "X-Files," mingling with the technical crew and standing in wait for the show's stars. 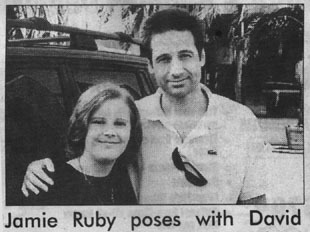 Her devotion and dedication would pay off in a big way, when, like a precious stone, Ruby would capture the attention of the show's star, David Duchovny, who would give the girl the ultimate souvenir to add to her treasure trove of celebrity keepsakes. "It was the best day of my life," remembered Ruby. "So far anyway." 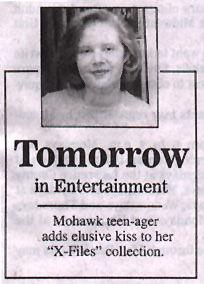 The senior at Mohawk Area High School was referring to the kiss she got from hunky David Duchovny who plays Fox Mulder. "After I was done talking to him, he just pulled me in to him and kissed me." "I almost melted into a puddle there." Back home in Ruby's bedroom, it seemed odd that Mickey and Minnie soft-stuffed dolls have the prominent spot atop her pillows on her neatly made, narrow bed. The only other non-"X-Files" items are five collectable fashion dolls on stands, dressed in frilly, long gowns, which are relegated to a top shelf away from the TV-inspired Scully and Mulder memorabilia that covers the walls and flat surfaces in an orderly and well-thought-out fashion. There are 40 autographed and framed photographs relating to the TV show hanging on the wall about Ruby's bed. An "X-Files" hat -- "signed by everybody" -- is kept in a sealed plastic bag (Anderson signed it twice); a chest-high, double-doored cabinet is full of tapes of individual "X-Files" episodes; there are books and framed magazine cover stories; plus there's Ruby's Internet connection -- she has her own web page, visited by 7,837 "X-Files" fans since Aug. 24, 1999. Ruby's trip to California in August was her latest pilgrimage in honor of the TV series, which is possibly in its last season. Last year, Ruby attended "X-Files" expos in New York City and Detroit where she met and was photographed with Gillian Anderson, who plays Agent Dana Scully. Because of her devotion to the show and the popularity of her web page, Ruby was invited to California to get an up-close look at the process involved in making the series. Here sincere fan status landed her front and center for an unforgettable first-hand look at production of the show. In the hushed silence of the "X-Files" set, Ruby watched the final day of filming of episode four, "Hungry." She was given headphones so that she could hear what Mulder, Scully, and the brain eater -- Rob Roberts, were saying. During a break, she was reunited with Anderson. Ruby had taken gifts for the film star and her daughter, Piper. She also had gifts for Duchovny and others on the crew. She gave Anderson an album she made containing various pictures taken of her at the expo. "She really seemed to like the album and took her time to look through it," Ruby said. Ruby would spend close to an hour in Anderson's trailer playing with Piper. "Piper is so sweet. It was really great to see her (Anderson) being herself and playing with her daughter." When Duchovny appeared on the set to meet Ruby, he was dressed in a yellow polo shirt and jeans. Ruby theorized they were his own clothes since he left wearing them. Ruby had written a poem for Duchovny. It expressed her happy feelings about getting to meet him. "It's known he likes literature and poetry." The actor took out the poem and read it to himself in front of Ruby. 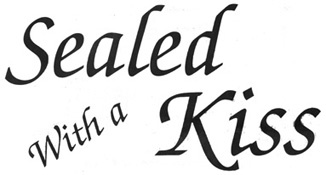 "I about died," the teen gushed. "All I could say is that is was kind of sappy. Of course I wanted him to read it, but it's still kind of embarrassing." Ruby got two pictures with the film star who then kissed her. "I couldn't believe it. I didn't expect it." A crew member later congratulated her for not screaming upon meeting Duchovny. The teen would admit to being moved to tears, however. She says it's rare for people to meet Duchovny, and still rarer to get a kiss. Ruby says she's only talked to three people over the Internet who've met him. "I know I'm obsessed," she joked good naturedly. "But, I don't just go crazy. "I like talking to them. Not just David and Gillian, but other people working on the program too. "Anybody involved in it is just great."